As promised yesterday, this week’s new music comes in two doses, and here’s the second. Yesterday the best New Music festival in the country made its first line up announcement. The Great Escape Festival, taking place from 8th-10th May this year, released a list of over a hundred names, including a good representation of local talent. Royal Blood, Theo Verney and Yumi & The Weather are in there, as well as honorary Brightonians (by virtue of their Source cover feature) Traams. There’s still a chance to apply – Artist registration is open until the end of January, and more details can be found here. Things on the gig front in Brighton are still rather quiet, so this weekend’s gig post isn’t quite the usual bumper affair. There are a couple of gigs which have caught our eye – Carnival Collective at the Blind Tiger on Friday Night, and Chris T-T at Bermuda Triangle on Saturday Night – but the one thing that we really really like the look of this weekend was Green Door Store’s Third Birthday. Has it really been three years? They’ve got five bands playing on Friday Night, two of which are local talent. Slum of Legs (on at 10pm) and Theo Verney (on at 12:15) join three London bands and a whole host of DJs who have hosted club nights there. The fun kicks off at 9pm, and it’s all free. Here’s our choice of the best local bands to see around town this weekend. As always, we’re spoiled for choice. Tomorrow night we’ll be heading down to Latest Music Bar for The Beautiful Word’s launch for their new album Particles. Support comes from The Common Tongues and the brilliantly named Emperors of Ice Cream. Meanwhile, over at Brighton’s newest venue Bermuda Triangle (tucked in alongside Digital) Theo Verney and Bad For Lazarus are supporting Traams for the launch of issue number three of Boon Magazine. Also on Thursday is Fragile Creatures second curated night at the Blind Tiger. This time around they’re bringing along Octopuses for some live music and The Maydays for Wheel of Fortune Karaoke. Friday Night is this month’s Les Enfants Terribles, who have a great line up as ever. Top of the bill at the Blind Tiger this month is Plum, a relative newcomer to Brighton who has plenty of accomplishments under her belt – earlier this year she was awarded Best Electronic Artist at the Scottish Music Awards. Alongside her are Phantom Runners who have recently been making the video for their new single and local Math Rock trio Patchwork Natives. 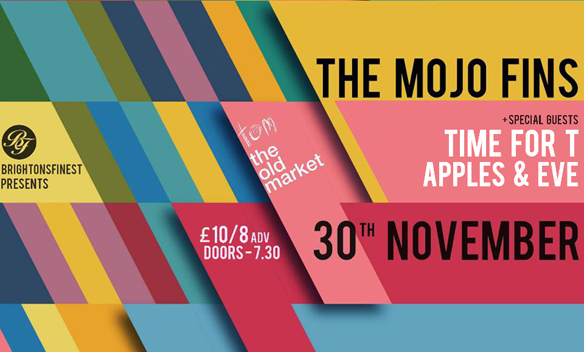 On Saturday Night, Brighton’s Finest host an evening at The Old Market. The night is headlined by The Mojo Fins, but it’s also worth noting that it’ll be your last ever chance to see support act Apples and Eve live before they split up and go their separate ways. Here’s our regular round up of the latest Brighton music that we’ve come across, and if we can’t write about that with a blog name like ours, what can we? We took delivery of the 7″ of Could You Be Wrong a few weeks ago, but because of a bit of confusion on our part we put off writing about it until we thought it was out. Only we got the release date wrong. The track is four minutes of solid indie pop, well produced with catchy sha-la-la’s drawing you into the chorus. We liked it enough to put into our September Top Five blog post even though we hadn’t written about the track by then, and that should tell you how good we think it is. Flip Side ‘The Wake Of Us’ with it’s spoken word verses is pretty tasty too. Speaking of tasty things, the video for the Beautiful Word’s new single is literally a food fight. Eating Me, Eating You has come out in advance of the band’s album Particles which hits the shelves in about six weeks time. At the moment GAPS aren’t putting a foot wrong. After the double A side Keep You / Cascade back in the summer, the duo have put out the more acoustic sounding Belong as a free download. GAPS are on the bill at the Green Door Store next Friday (11th October) supporting Pawws. Eagles for Hands put up their new EP as a free download today (after previously being for sale). We don’t know how long it’s going to be free, so grab it while you can. Head straight for the lead track Lisbon, or the blissed out House of track 4, Peaks. Maker posted up the original version of Hopeless about a year ago, but it’s been given a new electro lease of life by Champione, who impressed us with his Home EP earlier this year. Subtle synth pop has been transformed into effervescent anthemic house. Theo Verney’s Heavy Sun EP is out later this month on Hate Hate Hate records, but the lead track is up now for all to hear. Heavy choruses collide with deceptively pop verses. Flip side Count It Up can also be heard over on Hate Hate Hate records’ Soundcloud page. Brian Eno protege Jon Hopkins has provided the score for upcoming film How I Live Now, and has roped in Bat For Lashes for the single that goes with the soundtrack. Garden’s Heart is out on Partlaphone next monday and as well as vocal and writing credits, Natasha Khan also directed the video.